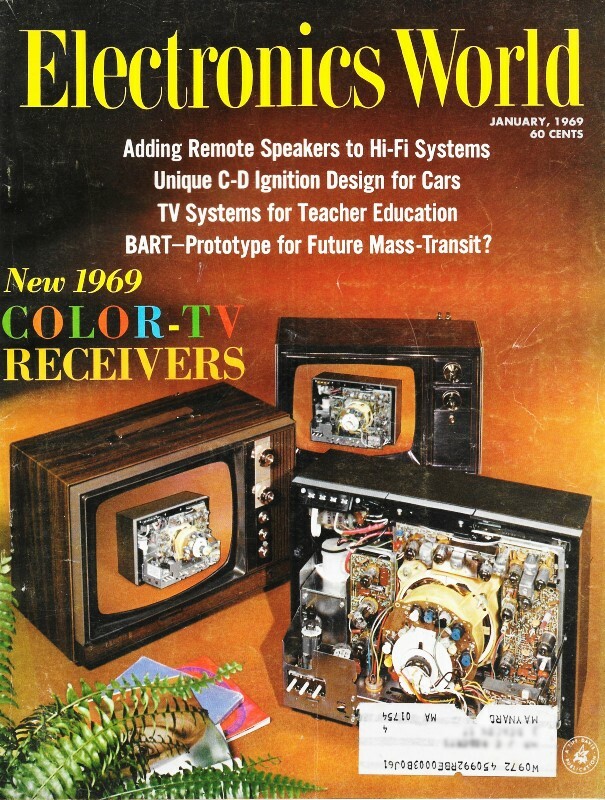 As mentioned often here on RF Cafe, especially with an ever-increasing amount of devices and appliances with "no user serviceable parts inside," the demand for electronics technicians is as great today as it was decades ago. Associated equipment is significantly different now and a lot more of it consists of swap-out modules and assemblies rather than performing repairs in the field. However, there still exists a significant amount of legacy electronics everywhere, and it all needs to be maintained until upgrades are installed. There are still many electronics repair depots around the world with teams of electronics techs doing component level troubleshooting and repair. The Internet is awash with sources of replacement parts from OEMs, third parties (sometimes 'grey market'), and cannibalized discarded products. Production and design facility staff includes electronics technicians for assisting engineers and for operating test setups. Now, as then, one of the greatest obstacles to assuring a ready supply of qualified techs is pay and benefits. 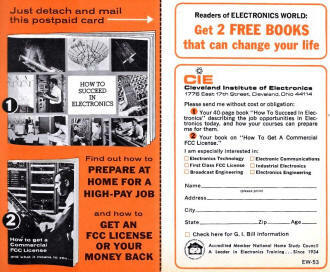 See also How to Become a 'Non-Degree Engineer in the May 1966 Electronics World, Cleveland Electronics Institute Electronics Slide Rule Advertisement in the August 1967 Electronics World, RCA Institutes Advertisement in the June 1969 Electronics World, and Engineering Level Opportunities for You in the February 1970 Popular Electronics. 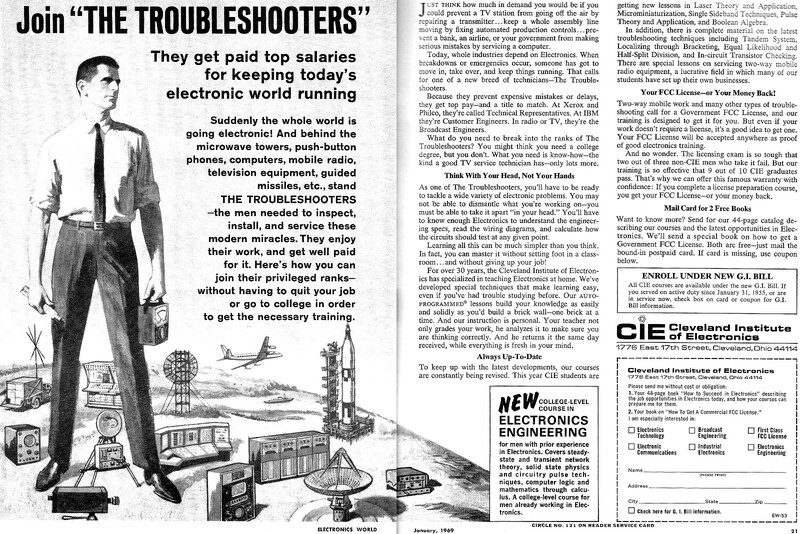 They get paid top salaries for keeping today's electronic world running. Suddenly the whole world is going electronic! And behind the microwave towers, push-button phones, computers, mobile radio, television equipment, guided-missiles, etc., stand The Troubleshooters - the men needed to inspect, install, and service these modern miracles. They enjoy their work, and get well paid for it. Here's how you can join their privileged ranks - without having to quit your job or go to college in order to get the necessary training. Just think how much in demand you would be if you could prevent a TV station from going off the air by repairing a transmitter ... keep a whole assembly line moving by fixing automated production controls ... prevent a bank, an airline, or your government from making serious mistakes by servicing a computer. Today, whole industries depend on Electronics. When breakdowns or emergencies occur, someone has got to move in, take over, and keep things running. 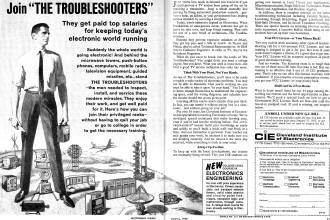 That calls for one of a new breed of technicians - The Troubleshooters. Because they prevent expensive mistakes or delays, they get top pay - and a title to match. At Xerox and Philco, they're called Technical Representatives. At IBM they're Customer Engineers. In radio or TV, they're the Broadcast Engineers. What do you need to break into the ranks of The Troubleshooters? You might think you need a college degree, but you don't. What you need is know-how - the kind a good TV service technician has - only lots more. As one of The Troubleshooters, you'll have to be ready to tackle a wide variety of electronic problems. You may not be able to dismantle what you're working on - you must be able to take it apart "in your head." You'll have to know enough Electronics to understand the engineering specs, read the wiring diagrams, and calculate how the circuits should test at any given point. Learning all this can be much simpler than you think. In fact, you can master it without setting foot in a classroom ... and without giving up your job! 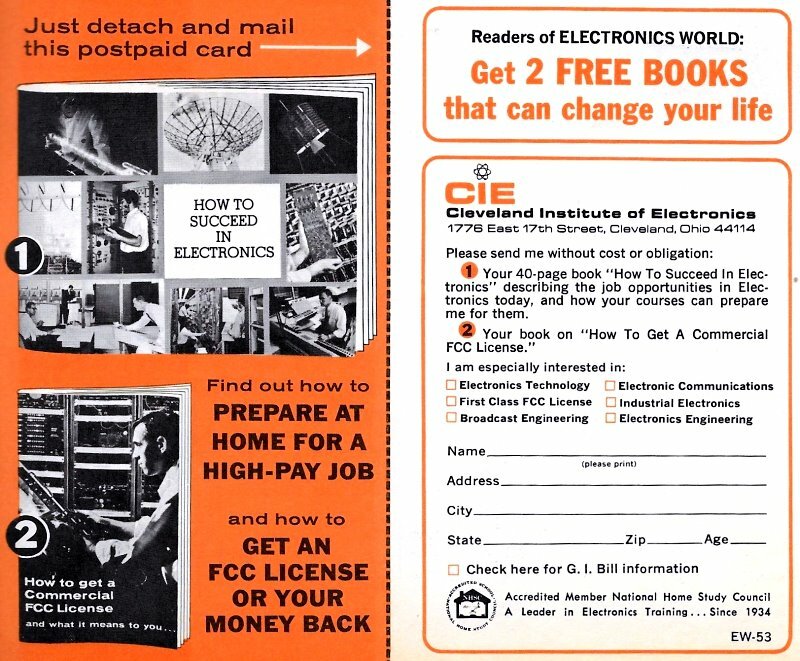 For over 30 years, the Cleveland Institute of Electronics has specialized in teaching Electronics at home. We've developed special techniques that make learning easy, even if you've had trouble studying before. Our Auto-Programmed® lessons build your knowledge as easily and solidly as you'd build a brick wall - one brick at a time. And our instruction is personal. Your teacher not only grades your work, he analyzes it to make sure you are thinking correctly. And he returns it the same day received, while everything is fresh in your mind. getting new lessons in Laser Theory and Application, Microminiaturization, Single Sideband Techniques, Pulse Theory and Application, and Boolean Algebra. In addition, there is complete material on the latest troubleshooting techniques including Tandem Localizing through Bracketing, Equal Likelihood and Half-Split Division, and In-circuit Transistor Checking. There are special lessons on servicing two-way mobile radio equipment, a lucrative field in which many of our students have set up their own businesses. for men with prior experience in Electronics. Covers steady-state and transient network theory, solid state physics and circuitry pulse techniques, computer logic and mathematics through calculus. A college-level course for men already working in Electronics. 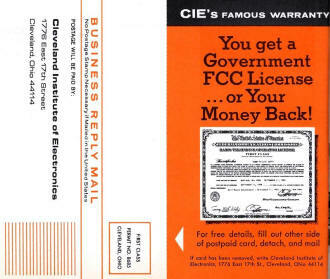 Your FCC License - or Your Money Back! Two-way mobile work and many other types of troubleshooting call for a Government FCC License, and our training is designed to get it for you. But even if your work doesn't require a license, it's a good idea to get one. Your FCC License will be accepted anywhere as proof of good electronics training. And no wonder. The licensing exam is so tough that two out of three non-CIE men who take it fail. But our training is so effective that 9 out of 10 CIE graduates pass. That's why we can offer this famous warranty with confidence: If you complete a license preparation course, you get your FCC License - or your money back. Want to know more? Send for our 44-page catalog describing our courses and the latest opportunities in Electronics. We'll send a special book on how to get a Government FCC License. Both are free - just mail the bound-in postpaid card. If card is missing, use coupon below. All CIE courses are available under the new G.I. Bill. If you served on active duty since January 31, 1955, or are in service now, check box on card or coupon for G.I. Bill information. 1. Your 44·page book "How to Succeed in Electronics" describing the job opportunities in Electronics today, and how your courses can prepare me for them. Check here for G. I. Bill information. Your 40·page book "How To Succeed In Electronics" describing the job opportunities in Electronics today, and how your courses can prepare me for them. Your book on "How To Get A Commercial FCC License." 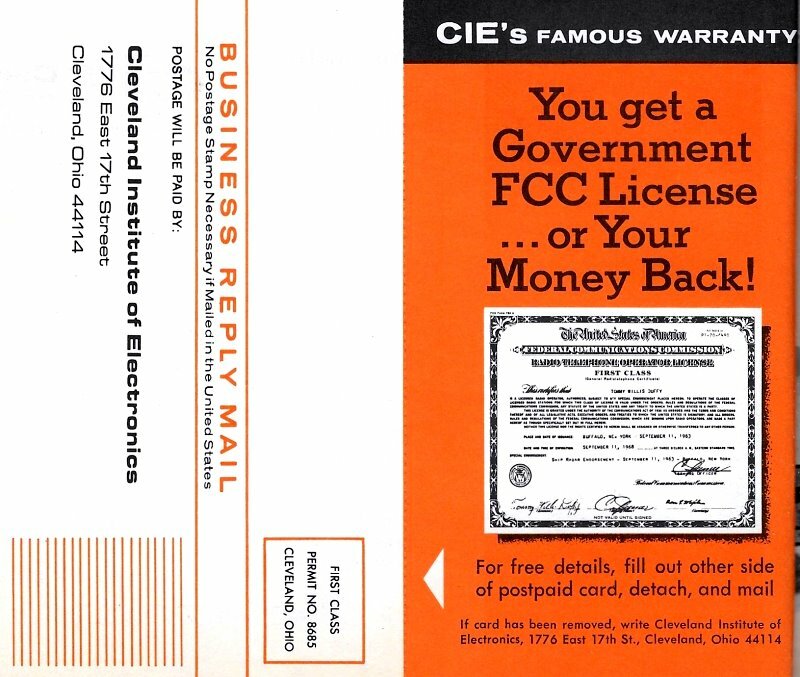 You get a Government FCC License ... or Your Money Back!